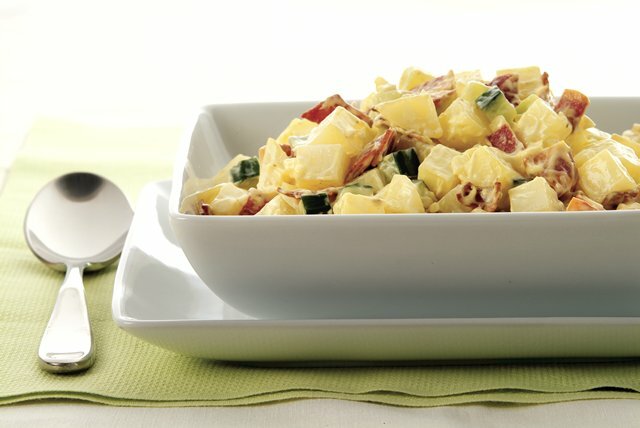 Crisp turkey bacon pieces, cucumbers, onions and cooked potato cubes are blended with a creamy mustard and garlic mayo in this easy summer salad. Mix mayo, mustard and garlic powder until blended. To cook potatoes in the microwave, place cubed potatoes and 1/4 cup water in 2-qt. microwaveable casserole; cover with lid. Microwave on HIGH 10 min. or until potatoes are tender, stirring after 5 min. ; drain. Cool.